Hey there! I hope you had a beautiful weekend. Despite the fact that I came down with a nasty cold a few days ago, I had a great weekend filled with relaxation and rest. I'm starting to feel a little bit better, so I hope to be back to normal soon. Being sick in the summer is just wrong! Our bathroom is actually quite large, which is very nice! 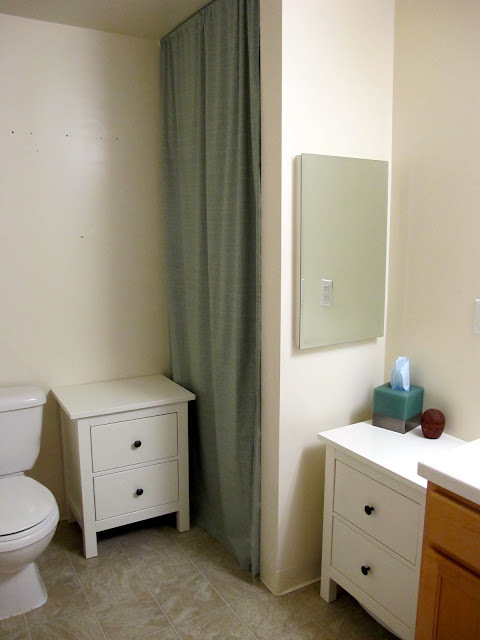 Evan and I can both get ready in the mornings at the same time -- something we couldn't do when we lived on-campus at Stanford (our bathroom was teeny tiny!). 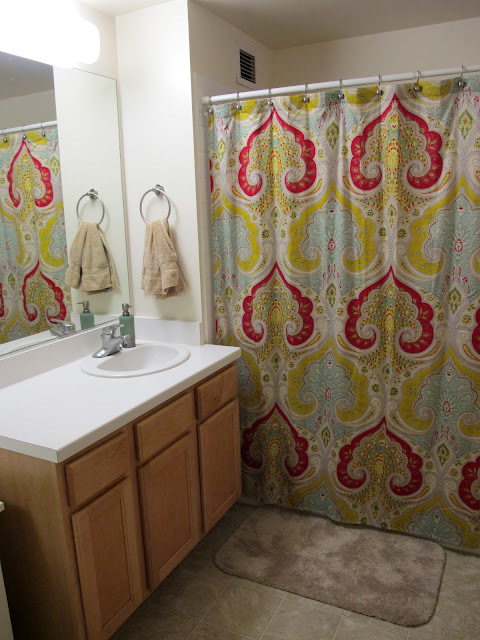 We purchased the shower curtain from Bed Bath & Beyond (here it is) - we just love the colors. Here's the other side of the bathroom. We found the two dressers/tables at Ikea - both fit perfectly into those spaces! I can't find them on Ikea's website - sorry! Evan's mom made us the curtain to cover the built-in shelves. Considering how small of place we live in, we do have great storage. We're still looking for some wall art and decor for the second table, and then the bathroom will be complete. More apartment pictures to come!